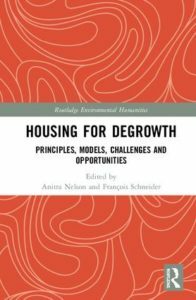 Housing for Degrowth — co-edited with Francois Schneider for publication in the Routledge Environmental Humanities series (3 August 2018) — presents various activist-scholar responses to the challenges posed in creating housing for degrowth. For details on our events in our European tour from 26 October to 4 December see our schedule. Download the Routledge Europe, UK and USA Housing for Degrowth PDF for discounted eBook and hardcover purchases. Contact anitra.nelson@rmit.edu.au to arrange purchase of an inexpensive paperback copy (25 Euros at events and available for postage and packaging in Europe by request). ‘Degrowth’ — a type of ‘postgrowth’ — is becoming a strong political, practical and cultural movement for down-scaling material and energy throughputs in our economies. Inshort, degrowth is about transforming societies beyond capitalist growth and other forms of productivism to achieve global sustainability and satisfy everyone’s basic needs. Degrowth values are based on sufficiency and conviviality, living a one planet lifestyle with low impact on the environment. One planet living means conserving and retrofitting buildings for sustainability, allowing for ‘alternative’ self- and group-builds, temporary use-rights to buildings vacant for long periods prior to re-development, and appropriate and affordable eco-housing. Degrowth movement debates over urbanisation, decentralisation and ‘open localism’ are revealed so the collection is attractive for student, professional, academic and activist readers. In many countries of the Global North empty, secondary and scarcely used buildings in cities and depopulated rural towns could be inhabited by households currently marginalised by high real estate prices. Contributors consider case studies including squatting, innovative financing of housing cooperatives, refurbishing (instead of demolishing) older social/public housing buildings, and ‘tiny houses’. See post on both Housing for Degrowth and Small is Necessary books on the Radical Ecological Democracy site. See RMIT University Centre for Urban Research ‘expert’ explains degrowth and housing for degrowth. Vincent Cheynet, ‘Habitat: L’urgence est d’arrêter de construire et de bitumer les sols’ in the French degrowth broadsheet newspaper La Décroissance: Le Journal de la Joie de Vivre, December 2018–January 2019, p. 13. Gamblin, Guillaume, ‘Une dynamique internationale de recherches décroissantes’ in Silence #476, March 2019, pp. 9–11. See a transcript of a short talk on both Housing for Degrowth and Small is Necessary books at the Localising Leanganook conversation—Food for Thought blog. See a recent print interview with me and a YouTube conversation between me and contributor to Housing for Degrowth, Natasha Verco, here. In countries of the Global South, overpopulated cities demand new housing using both contemporary and vernacular design, techniques and materials with self-build potential and appropriate energy and water technologies for eco-neighbourhood development. Case studies from South India and Vanuatu explore the potential and challenges. Most eco-neighbourhoods, ecovillages and cohousing show that shared living is more sustainable than small households in detached single-storey homes, and self-organising groups, such as squatters, have created abodes for simple living at little cost. Housing for Degrowth explores many of the environmental, cultural and economic issues posed in the context of interdisciplinary and transdisciplinary fields such as urbanism, ecological economics, environmental justice, housing studies and policy, planning studies and policy, sustainability studies, political ecology, social change and, of course, degrowth. Copyright © 2019 ANITRA NELSON. All rights reserved.